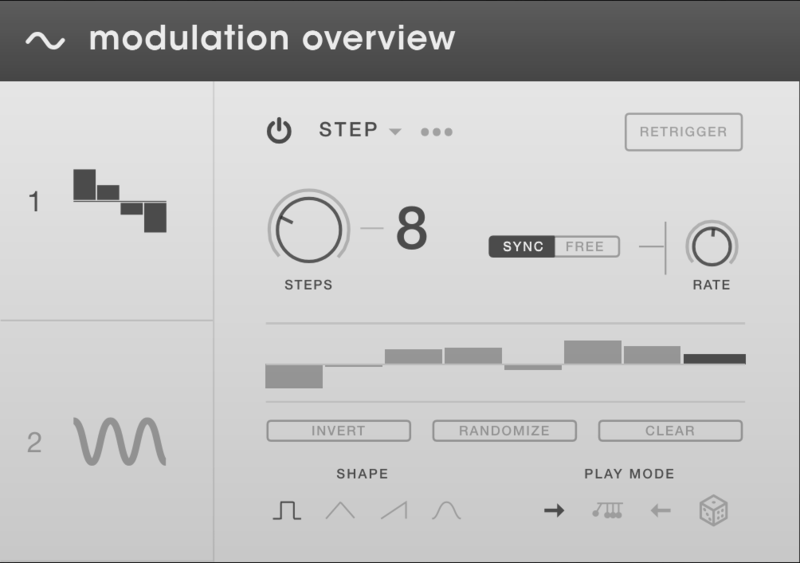 The Step Sequencer Modulation page features similar parameters to that of the LFO. The Step Sequencer Power button in the upper left-hand corner allows you to turn the modulation slot On or Off. Next to it you will see the word Step with a dropdown menu button. Here you can choose either LFO or Step modulation. There is a Retrigger button in the upper right-hand corner that dictates Sequencer position relative to MIDI note-on message. When the Retrigger button is On (Note Retrigger), every MIDI note-on resets the start of the sequence. In the Off position (Phrase Retrigger), the first MIDI note-on sets the start of the sequence and the sequence will continue as long as the note is held down. Under the Step Sequencer Power is the Steps knob that allows you to choose the number of count steps in a sequence, from 1 to 32. Next to it is the Sync/Free toggle. In Sync mode the modulation signal rate is a division of the host tempo, while in Free mode the modulation rate is set in Hz (free running). The Rate allows you to select the speed at which the sequence moves depending on the Sync/Free setting. The middle of the page houses the Step Value Modifier where you can choose from (Invert, Randomize, and Clear). Clear – sets all values to default. In the bottom left-hand corner, you will see Shape where you can select individual envelope for each step (Square, Triangle, Ramp, Rounded). In the bottom right-hand corner you will see Play Mode which allows you to modulate. Forward controls for playback direction. Pendulum mode plays sequence back-to-front once it reaches the end. Reverse controls for playback direction. Random mode plays steps in a random order.